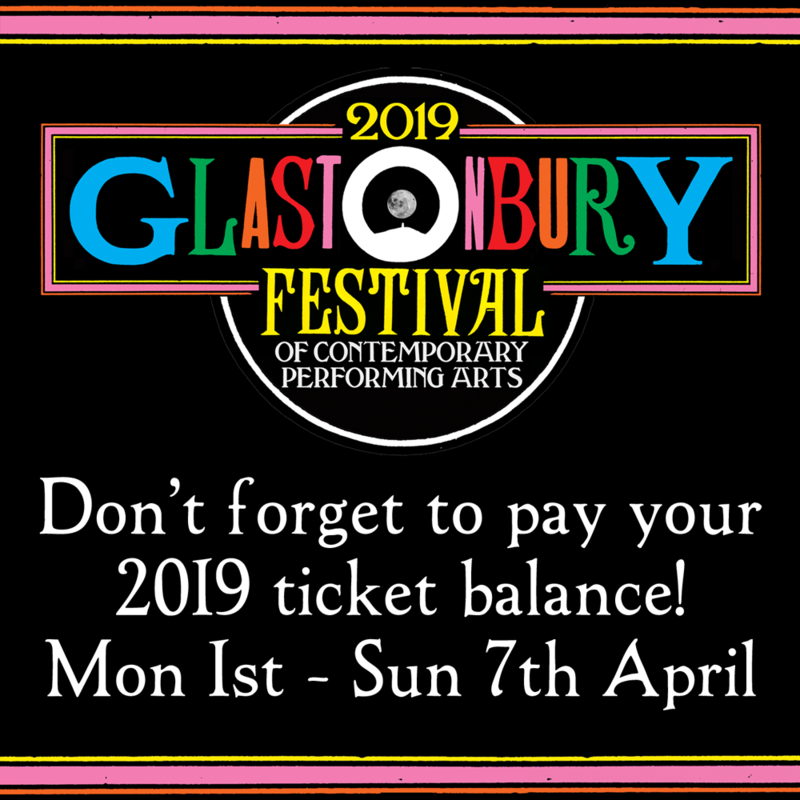 A reminder that if you have paid a deposit for either a general admission ticket or a coach package for the 2019 Festival, your balance payment of £198 + £5 booking fee per ticket is due between 9am BST on Monday 1st April and 11.59pm BST on Sunday 7th April 2019. You will also be able to add car park tickets and cancellation protection to your booking while paying your balance (see here for more information on cancellation protection). After the balance payments window, there will be a resale of any returned coach packages on Thursday 25th April, followed by a general admission resale on Sunday 28th April. If you are planning to pay a balance between 1st – 7th April, please take a moment to read these FAQs. CAN I PAY MORE THAN ONE BALANCE IN THE SAME TRANSACTION? Yes – you can pay the balance for up to 6 tickets in one transaction, providing you have all paid a deposit and they are all the same ticket type. By grouping your balance payments together you will only pay one postage and packing fee (£8.95 per order for general admission tickets, £1.50 for coach e-Tickets). You will need to provide each ticket holder’s registration number and postcode in order to pay their balances. You can only pay the balances together if they are for the same type of ticket. So you can pay the balance on up to 6 coach packages together, or up to 6 general admission tickets together, but you can’t pay the balance on a mix of general admission and coach packages in the same transaction. I PAID FOR SEVERAL PEOPLE’S DEPOSITS IN OCTOBER, CAN WE ALL PAY OUR BALANCES INDIVIDUALLY? Yes you can. Each person will just need to provide their registration number and postcode in order to pay their own balance. WHAT IS THE ‘LOVE THE FARM, LEAVE NO TRACE’ PLEDGE? I will only use the toilets provided and not pee on the land or in waterways. I will use the recycling bins correctly and not drop litter on the ground. I will take all my belongings home with me again, including my tent and all camping equipment. I will bag up my rubbish in the bin bags provided by the campsite stewards and use the recycling pens provided in each campsite. I will avoid single-use packaging and use a reusable water bottle wherever possible. Please commit to this pledge and ask others to stick to it too, to help ensure a sustainable Festival. We would also encourage you to read the Festival’s full environmental policies. If you wish to change your delivery address you can provide a new delivery address on the balance payment page. If your address changes after paying your balance, you can update your address details online at seetickets.com/customerservice. Please note changes to your delivery address will not update the address associated with your registration. If you wish to change your registered email address please contact See Tickets customer services on 0115 896 0073. When paying your balance you are given the option to provide a different email address to the one you registered with, but this won’t update your registered details. CAN I ORDER A WATER BOTTLE WHEN I PAY MY BALANCE? Yes. All taps across the Festival site provide safe drinking water, and this year we are once again working together with WaterAid to provide a reusable 500ml stainless steel water bottle featuring an etched design. The bottles will cost £10 each, with £2 going to WaterAid. They are available to pre-order when paying your ticket balance and can be picked up from the WaterAid kiosks across site. You can fill any water bottle at WaterAid’s kiosks and at any of the hundreds of water points for free. A reusable water bottles saves money and reduces the amount of litter generated onsite and we urge you to bring one. As part of Glastonbury’s sustainability goals we continue to look at ways of reducing the waste that is generated on the Festival site, which is why single-use plastic drinks bottles will not be sold at this year’s Festival. I’VE BOOKED A COACH PACKAGE, CAN I SWAP TO A GENERAL ADMISSION TICKET? No – coach packages are non-transferable. If you have booked a deposit for a coach package, then you need to pay the balance for a coach package. It isn’t possible to transfer to a general admission ticket (or vice versa). If you are unable to travel on the coach package you have booked, you will need to cancel your coach package (including the Festival ticket). All campervan tickets and tipis are currently fully booked. Any cancelled bookings will be made available in an accommodation resale after the main resale on Sunday 28th April via glastonbury.seetickets.com. Further details will be released nearer the time. IS THERE ANY MORE ACCOMMODATION AVAILABLE AT WORTHY VIEW? Worthy View is also currently fully booked. As above, any cancelled bookings will be made available in an accommodation resale after the main resale on Sunday 28th April, via glastonbury.seetickets.com . Further details will be released nearer the time. I’VE BOOKED A COACH PACKAGE, CAN I STILL BUY A CAR PARK / CAMPERVAN TICKET? No – car park and campervan tickets are only available to general admission ticket holders. It is not possible to purchase a car park or campervan ticket when booking or paying the balance for a coach package. WE’RE COMING IN A GROUP WITH A CAMPERVAN/CARAVAN, DOES EACH OF US NEED A CAMPERVAN TICKET? No. You only need to book one campervan ticket per campervan/caravan, but everyone aged 13 or over in your group will of course need a Festival ticket. Please note large vehicles, which require a pitch in excess of 8m x 7m, require a large campervan ticket, for the White route site. For more information about campervan and caravans please check out the campervan information page. SINCE I BOOKED MY DEPOSIT I’VE FOUND I CAN’T COME TO THE FESTIVAL, CAN I GET MY DEPOSIT BACK? Yes. Any tickets for which the balance has not been paid will be refunded £30 (a £20 admin fee will be retained) automatically onto the card on which they were booked within 7 working days of the balance payment period ending. If you already know that you won’t be able to come to the Festival, and would like to get your £30 back before the automatic refund, then please call See Tickets on 0115 896 0073. Please note if your card details have changed since you placed your deposit you will need to contact See Tickets to arrange your refund; and if a friend or family placed the deposit for you, the deposit will be returned to their card. If you are cancelling a coach package a total admin fee of £30 will be retained. You will be refunded your coach fare less a £10 cancellation fee, and your ticket deposit less the £20 cancellation fee. MY FRIEND CAN NO LONGER COME TO THE FESTIVAL, CAN I TRANSFER THEIR TICKET TO SOMEONE ELSE? No. Tickets (including deposits) are fully non-transferable. If one of your party is no longer able to attend the Festival they can obtain a refund of £30 for their deposit (see above); however you cannot reserve that deposit for someone else. Cancelled tickets will be put back on general release in the ticket resale. CAN I STILL BOOK A TICKET? Quite possibly, yes – don’t give up hope! There will be a resale of any returned coach packages on the evening of Thursday 25th April followed by a general admission resale on the morning of Sunday 28th April. I’VE PAID MY BALANCE BUT HAVEN’T HAD A CONFIRMATION EMAIL – HOW CAN I CHECK EVERYTHING IS OKAY? If you have not yet received confirmation of your balance payment you can retrieve your booking details at seetickets.com/customerservice. I’VE SEEN TICKETS ADVERTISED ONLINE, CAN I BOOK THROUGH ANOTHER COMPANY?